We live in the age of two-sided markets. The fastest growing and most valuable companies on the planet are changing the way we experience commerce, access services, and buy products. Transportation is at our fingertips with Uber and Lyft, lodging with Airbnb, products and services with Amazon and Amazon Prime, pharmaceuticals with Blinkhealth and RxSpark, and now healthcare services with Slingshot Health. We also live in the age of acquisition and integration. CVS Health acquiring Aetna, United Health eyeing Davita Medical Group, Walmart in talks with Humana. Moreover, the list goes on and on: Apple, Google, JP Morgan, and Berkshire Hathaway. We can gain great insight by studying and learning from these strategic moves. A vital ingredient of this challenging environment is the evolving healthcare consumer. In its 2018 Healthcare Consumer Survey, Deloitte identified critical touchpoints for consumers: searching for care (convenience and price transparency), using new channels of care (apps, virtual care, and health coaching), and willingness to share personal health data to improve care and overall health. 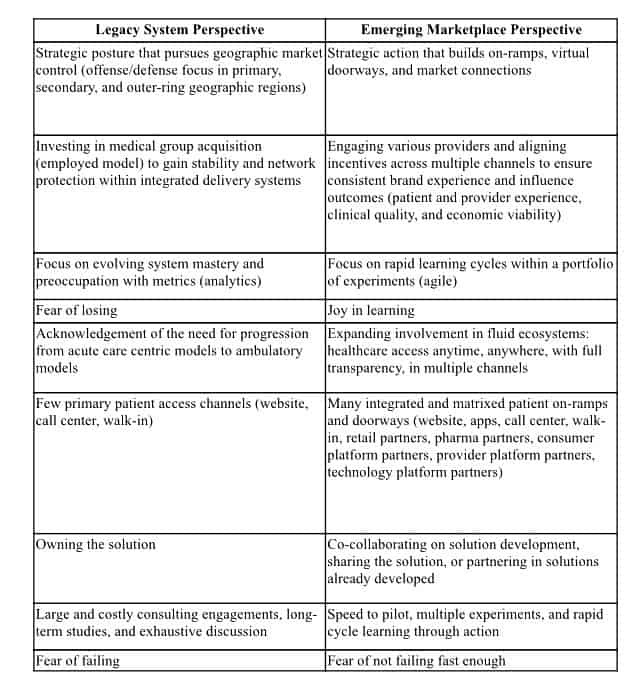 To remain relevant, hospitals and health systems must move from the legacy model of geographic markets, bricks and mortar, and closed-loop networks to a new paradigm of on-ramps, virtual doorways, care channels, data translation, and a fluid, two-sided healthcare ecosystem. Not only are consumers interested in this evolving marketplace, so is our government. In August 2018, the Centers for Medicaid and Medicare Innovation (CMMI) released a request for information seeking “detailed information from organizations with experience with transmittal and storage of health care supplier information; personally identifiable information (PII); protected health information (PHI); health care price comparison data; and bid/auction data for health care procedures. We are seeking information from organizations with specific experience in health care price comparisons and on-line bidding for health care services and procedures between consumers and healthcare providers/suppliers.” The emerging healthcare marketplace is coming, and it is coming fast. The emerging healthcare ecosystem will be transformative for both patient and provider experience. As this marketplace evolves, it will also transform structures, our approach to systems, and realign those we acknowledge as winners and losers. It will change everything about how we design healthcare, create access to healthcare, and pay for healthcare. For those in the health industry sector, the opportunity is substantial and the challenge real. It seems appropriate to share a closing thought from a trusted and well-known source of wisdom: Winnie the Pooh. With joy, wonder, and hope, it’s important to celebrate where we are and where we’ve been. In our celebrating, however, we should not linger too long. To move forward requires a walking away of sorts. An embracing of uncertainty, experiment, and risk. A purposeful posture of trusting those with whom we travel; a collaborative stepping into the unknown. A vibrant, delightful, always accessible and responsive healthcare marketplace is ours to create. Let’s go. This piece was written by Robert Sundelius, COO of the Ascension Medical Group, Michigan Market. 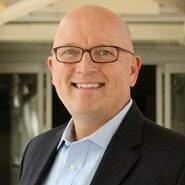 A fellow with the American College of Healthcare Executives fellow, Sundelius previously served as SVP of Practice Group and System Business Development at Memorial Healthcare. To follow him on Twitter, click here.